John McCain, Secretary of State of the Deep State: Has He Gotten to Trump? Serbian historian and political scientist Sasa Adamovic says Senator John McCain is more than just a US senator: He’s the ‘secretary of state of the US deep state’. The question now on many people’s minds is: has he finally gotten to Trump? On Monday, Senator John McCain started another tour of the Balkans, where he is remembered for his support of the NATO bombing of Yugoslavia in 1999, and for calls for Western powers to stage a ground operation in the region. Arriving in Belgrade, McCain held a private meeting with recently reelected Serbian President Aleksandar Vucic. The two were expected to discuss Belgrade’s stance toward Syria, as well as Serbia’s foreign policy orientation in general. 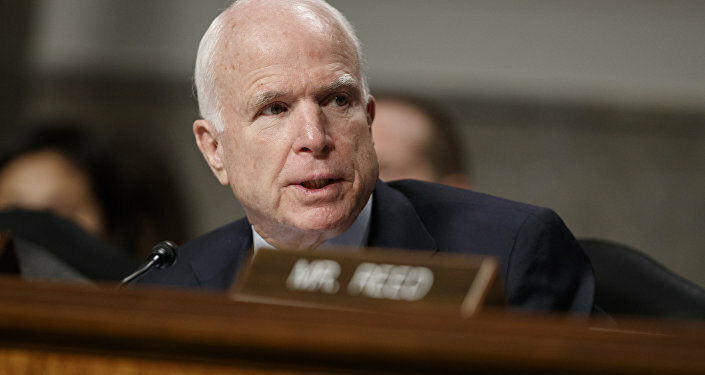 McCain commended Belgrade for its active partnership with the US in military exercises. At the same time, Vucic assured the senator that the country was not going to join NATO, or any other military bloc, but would retain its independence and neutrality. McCain spent part of the joint press conference with the president condemning Russia for its involvement in Syria, and emphasized the US would continue training militants fighting against Syrian President Bashar Assad. The senator, Sputnik Serbia contributor Nenad Zoric wrote, has fortuitously found himself at the center of nearly every global ‘hot spot’ over the course of several decades, including those that are still just heating up. Lately, his name has been mentioned repeatedly around the efforts to get Montenegro to join the NATO alliance. “Before that, he had a vision for ‘solving’ the crisis in eastern Ukraine, in the Middle East,” etc. “Who is John McCain? In whose name does he speak? Whom does he represent?” Zoric asked. Is he a senator? An influential member of the Republican majority in Congress? A proponent of key US lobbying interests? According to historian and political scientist Sasa Adamovic, McCain is all of the above, but also more than that. The senator, he says, has a direct connection to the American deep state. “Although formally, McCain’s title is that of senator, in reality, it would be more appropriate to call him the ‘secretary of state of the deep state’, fighting against Trump’s foreign policy, and trying to sabotage his foreign policy agenda, which is primarily oriented toward normalizing relations with Russia,” Adamovic said. “McCain’s visit to Serbia can be understood as a kind of attempt to ‘save’ the Balkans from Russian influence, since it is here that the deep state sees the front line between the US and Russia,” the observer added. Adamovic stressed that McCain has promoted an interventionist foreign policy for over a quarter century now, regardless of who – Democrats or Republicans, were in charge in Washington. “The deep state, which suffered a defeat in the last elections, does not want Trump to change the US’s foreign policy trajectory, and what McCain is now doing is classical sabotage – an attempt to keep US foreign policy the same as it had been until now,” the observer concluded. Amid the events of the last week, including President Trump’s unexpected decision to carry out cruise missile strikes against a Syrian airbase in response to allegations that the Syrian Air Force had launched a chemical attack on rebels in Homs, many observers, including long-time Trump supporters, have pondered whether the deep state, and people like John McCain, may have finally gotten to him. It seems only time will tell whether their fears are warranted.